With the holidays just around the corner, the January sales period may seem far away but before you know it you’ll be cracking opening the champagne to count in the new year and 2013 will be a thing of the past. 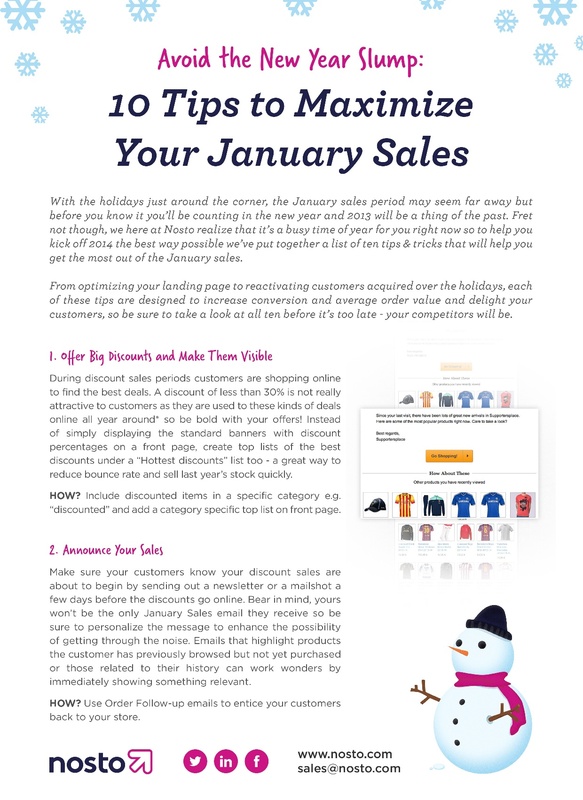 Fret not though, we here at Nosto realize that it’s a busy time of year for you right now so to help you kick off 2014 the best way possible we’ve put together a list of ten tips & tricks that will help you get the most out of the January sales. From optimizing your landing page to reactivating customers acquired over the holidays, each of these tips are designed to increase conversion and average order value and delight your customers, so be sure to take a look at all ten before it’s too late – your competitors will be.